Easy to look at, monotone site, clean, has no ads, no popups, clearly trying to attract more users, still in its “growing” stage.. Ads usually scare people off, as well as popups. Another feature this site boasts is youtube URL editing for quick access. 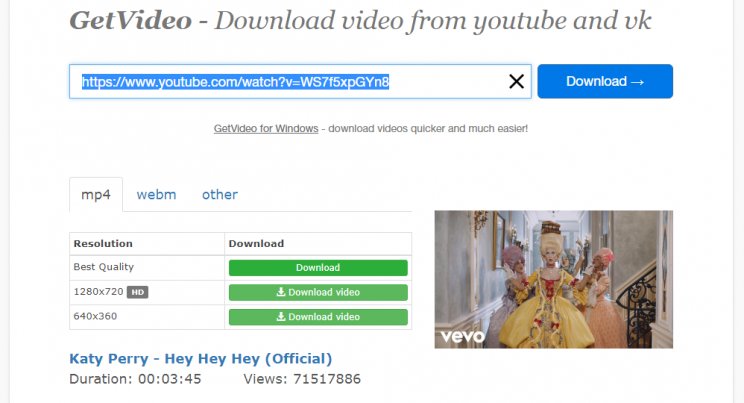 If you’re ever watching some video on youtube, all you need to do is edit the URL in the browser, and you’ll be redirected to GetVideo’s download page for this video. 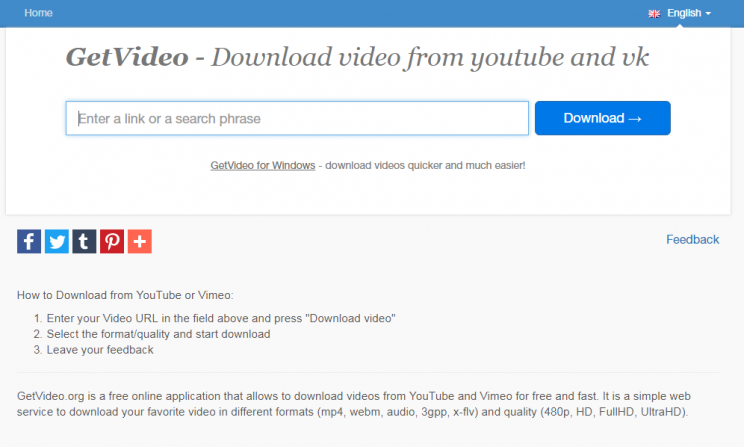 The process goes by adding 2 letters to the URL in front of youtube.com address, to make it “gvyoutube.com”, and press enter. this will send you to their download page, and it’s a quick way to do this. Still, the “classic” way is when you copy the URL and insert it in the box. SO technically it’s an exact same number of clicks or keystrokes.. It offers https security, so that’s good… On the other hand, after you submit a download link or take the path with gvyoutube described above, https breaks, site is trying to load some scripts from none-https sources, so all the security provided by https becomes useless.. If some part is not secure, no part is secure.. So after all this is a nice site, although quite limited only doing video downloads. No youtube mp3 conversion here, keep in mind. If you’re looking for one, check out our list of Top 20 Best Youtube Mp3 converters. Otherwise really this site is in no way better than savefrom, 9xbuddy or y2mate. 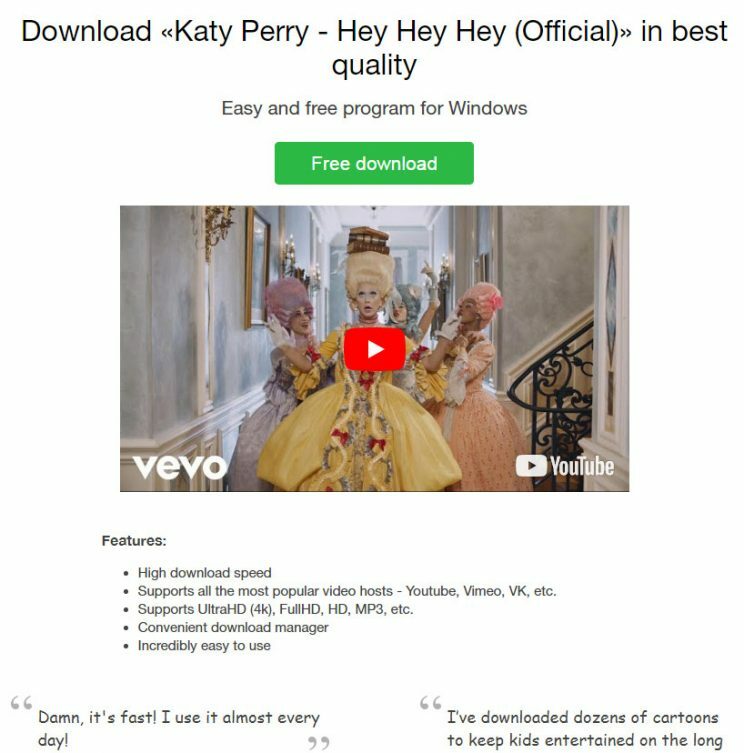 Even new Savemedia Website does both video downloads and mp3 conversions..
Now we’ll be trying to download Katy Perry’s new video called Hey Hey Hey. In the last few articles i’ve switched to downloading stuff that is seemingly OK to download. But later i realized that it’s not that… Downloading stuff from youtube is not illegal. It does go against their Terms of Service, that say you cannot do it. But on the other hand, it is not a felony. It’s just a violation of their TOS. the worst that can happen is you lose your access to youtube. That’s all. Then you can use proxy to get there, but the point is clear: downloading from youtube is not illegal, it’s just bad behavior.. Youtube, music labels and other copyrights’ holding companies want you to think you’re breaking the law. No, you are not. All you are doing is going against Youtube’s wishes that they’ve announced in their Terms of Service.. Same as having your dog poop on lawn that has the “curb your dog” sign.. It’s not illegal. Some people might get pissed about it, maybe poop on your doorstep at night, but that’s as far as it goes… mp3 converter sites like listentoyoutube or soundcloud to mp3 are fully fine.. They are just maybe not correct to do what they do, but still, it’s not an illegal behavior.. In any case, let’s get back to the tutorial at hand… In the next few images I will show how easy it is to use GetVideo.org. Open up their front page and check it out. usually it starts getting info on its own, and the image below shows the “working” indicator.. if process didn’t start, press the Big Blue Download button. Step 3. Pick your download format and go for it! Now we can finally figure out why there were no ads.. Cause of the software.. First option for video download is the “Best Quality” button that redirects you to the page where you can download software… 720 option is available though..
Best Quality failed us, so the next best option is 720p HD which is pretty much the go-to format for all the sites.. The most you get online is 720p HD downloads, except for peggo.tv as mentioned, they do 1080p HD. fast download happening from youtube’s servers. good job!